Download free Chess Programs for you to play at home. Here you get a free chess download ( Chess Games download free ) of chess software which you can use at home on your computer to play. Just install the various chess programs listed on this page on your PC and get some training. Play a lot of chess games at home to learn how to move your chess pieces properly. When you have downloaded it, just extract it (unzip it) to the directory called: programs. When you do this, it will create a folder named NagaShaki_512. That's where you will find it. I promise you something. This program will not humiliate and frustrate you because you can choose different player personalities. Some play weak and others play strong. This makes playing quite interesting for you. Adjust the pieces and the chess board first. I suggest you go into the menue and chose BOARD / NEWS PIECES and WOOD BOARD. As you can see, Miss Molly is pretty weak. But she will still take you apart when you are a beginner at chess. So watch it, she will get you in the end. At the link below you can download some more chess programs for your PC to play at home. If you are a beginner at chess, you probably don't have a chance, but don't worry, there is help on the horizon. If you lose every game then come back to my site and learn some chess strategies. When you have downloaded it, you have to extract it into a new empty directory, which you have to create first. You can call the directory GNUCHESS, if you like. This free chess program is pretty simple to use, but strong. You will find it hard to beat. Now you can test the chess strategies that you have learned so far. So, off you go, my friend! Jose Chess is also a very nice chess program indeed. It has good graphics. You will like it. 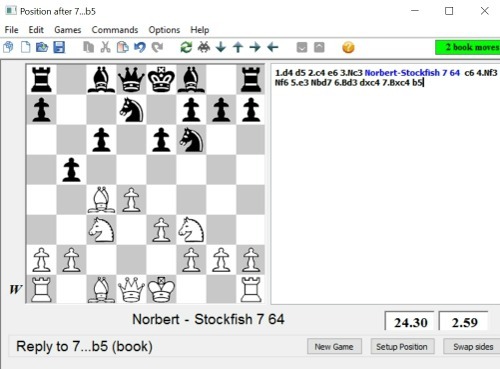 Crafty is a well-known freeware chess program. I like the graphics very much. These chess engines have grandmaster strength and know theoretically correct chess openings. You will not beat them. You get all you need in one free setup package. All you have to do is to download and install this package on your computer. 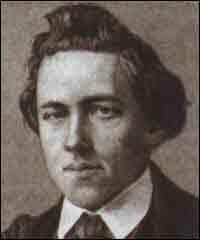 - You can play games against a selected chess engine, with a time handicap if desired. 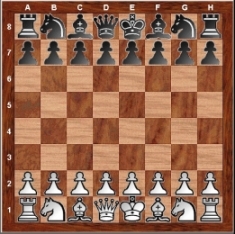 - Setup a chess position and get it analyzed by the engine you have selected. Then play through the moves afterwards provided by the engine to study the position. - You can create and edit.pgn files. Enter variations or enter and edit comments easily (just click anywhere and start typing). If you like to select another engine then click on OPTIONS/ENGINE then a window opens. See below. 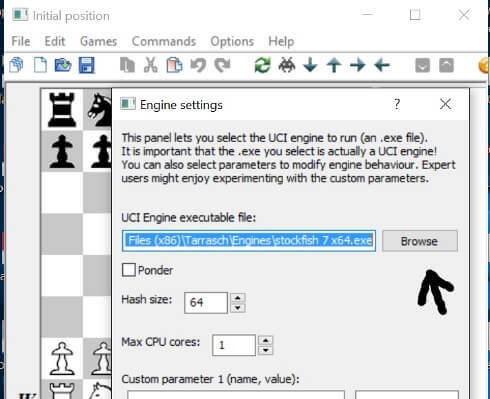 Click on BROWSE and you can see the list of chess engines available. See below. You can find other engines on the internet and copy them into this list. To find the folder (engines) that includes the engines, go to System(C:)/Programs/Tarrasch/Engines. 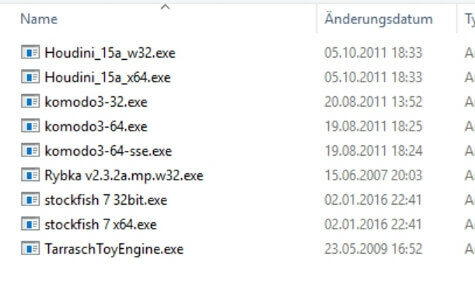 In this folder all engines are listed. 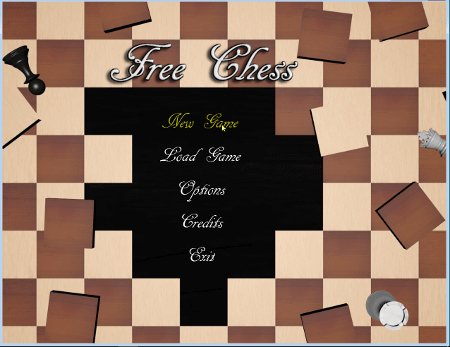 The PC chess program FreeChess is easy to use as it has no complicated options. However, the text is hard to read and it uses the complete screen of your computer. You are not able to resize it. The black pieces are somewhat difficult to see because the dark squares are too dark and this makes it hard to see the black pieces when they sit on dark squares. It has high-quality graphics and a 2D and a 3D view. To exit the running game click the ESC button of your PC. Click New Game then new Window shows. See below. - Click on the PC Image on the right side of White until it shows a Pawn image and text changes to HUMAN. - Select 2D or 3D view clicking on first chess board at the top right corner. - Turn chess board by clicking on second chess board at upper right corner. - To take a move back click on the arrow below the two chess boards at the upper right corner. Below you can download Freechess to your PC and install it. When installed it will place an icon on your desktop.